and made a LANDING PAGE for my facebook page. and it was super easy... and FREE! as far as the Business Page Timeline goes. Will it be forced upon facebook business pages? Will the apps we now use be compatible? on a custom facebook page. just starting out... so free is good! If you want to get started, just click the link at the bottom of my landing page. It will take you to wix.com where you can pick the template for your page. Remember while you're working on it to save frequently! Play around with it a bit. You can change the background colors. Add social media links. Use different effects on the buttons they have. Upload your images and make them link to your shop. When you're all done... hit publish! Follow the directions on installing... which is really just clicking some buttons and they install it to your page for you. Once you have it in place, go to the Edit Page button in the top right corner. You will want to go to Apps on the left side menu. 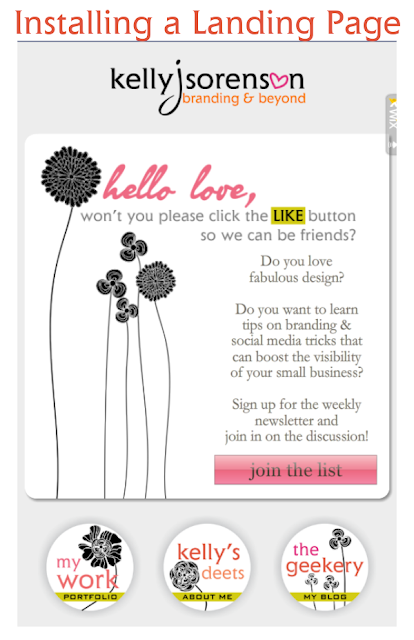 Click on edit settings for your Wix app and you can rename your landing page. They name it My Site, I changed it to Welcome. Then you'll want to go to Manage Permissions, again this is on the left side menu. Here you can set your Default Landing Page. Save it and you're done! Newbies will be taken directly to your fancy new landing page and your faithful fans will go directly to your wall. Stumbled and google+1'd this post for you! I really need to do this. I tried one day and gave up because I wasn't feeling so well. Thanks for sharing with us. Off to +1 and tweet this so others can read your awesome post! I've read some good stuff here. Certainly worth bookmarking for revisiting. I wonder how a lot effort you put to make the sort of great informative site.